The Montse Bassons Couture Spring/Summer 2015 Show, titled « Etoile of the 21st century / La Etoile del Siglo XXI », was an homage to Pyotr Ilyich Tchaikovsky’s « Swan Lake ». Ronald Searle’s St Trinian’s School has influenced the Olympia Le-Tan Spring/Summer 2015 Collection. 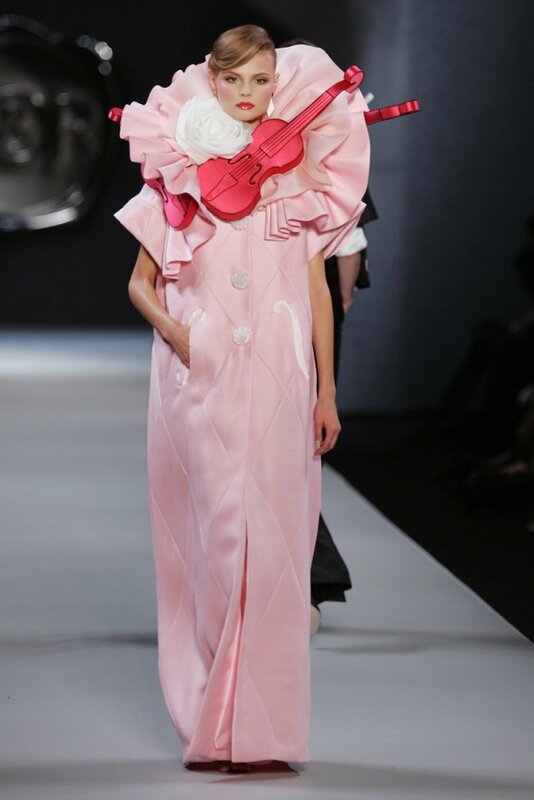 The Viktor & Rolf Spring/Summer 2008 Show paid tribute to Marcel Marceau and the art of pantomime. Another Marcel Marceau-influenced collection : Araks Autumn/Winter 2009-2010 (Araks Yeramyan drew inspiration from Marcel Marceau and French clown outfits). The Joyrich X The Simpsons collection, for Spring/Summer 2014, in association with 20th Century Fox, celebrates the 25th anniversary of The Simpsons. Other The Simpsons-inspired collections and items : Isabel Marant Spring/Summer 2011 (« Bart Simpson » motif, on graffiti-printed pants), Jeremy Scott Autumn/Winter 2012-2013 and Jeremy Scott Autumn/Winter 2012-2013 Menswear (Bart Simpson-influenced knits), Joyrich X The Simpsons Spring/Summer 2012, M.A.C X The Simpsons (this makeup line, which will be available in September 2014, pays homage to Marge Simpson).